Nurses protested in front of the health ministry on Thursday to call on the government to improve their working conditions. Members of the Taiwan Nurse Medical Industry Union (TNMIU) chant their slogans in front of the Ministry of Health and Welfare. 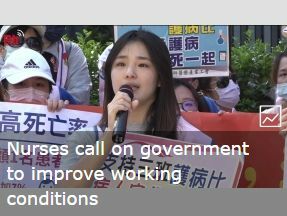 They are calling on the government to improve their working conditions by hiring more nurses.